In this Experience, join us on a trip to the Moon! Material for students: Videos that can be watched in the classroom to enhance the Experience. Material for teachers: Information about the activity that students will carry out during the visit. Click here to download the Scientific Case, game cards and the Moon map. Do you know what type of object the Moon is? Well done! The Moon is a satellite! But, it is not similar to other 'metallic' satellites sent into space, is it? That's right! The Moon is a natural satellite, that rotates, or orbits, around the Earth. Why is the Moon not considered to be a star? Stars emit light through the nuclear reactions taking place in their cores (because of the intense pressure and temperature there). The Moon does not emit its own light, we see the Moon because it reflects light from the Sun. Why is the Moon not considered to be a planet? Planets are astronomical objects that orbit around a star. In addition, planets have swept out debris and small ojects from the area of their orbits. Do you know how far the Moon is from the Earth? The Moon is about 384 000 km away from Earth !! 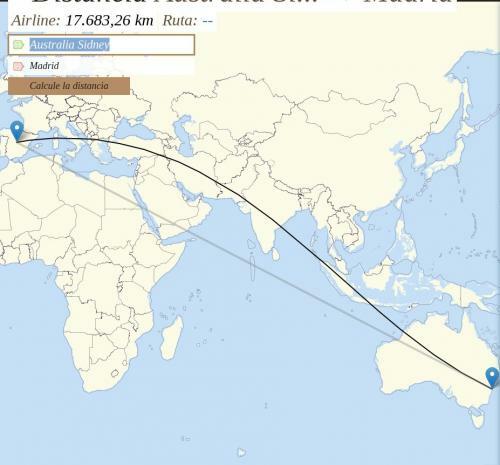 Can you imagine this distance? 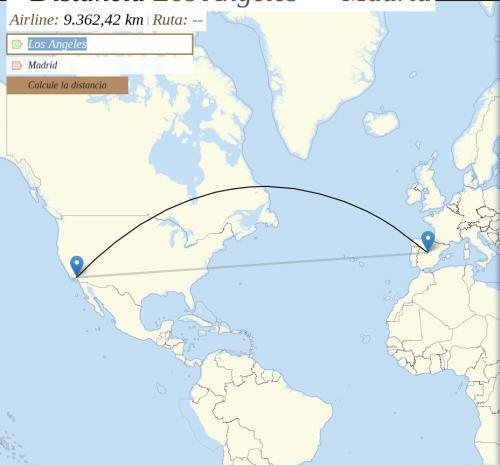 Here are some examples of distances on Earth to help you out. As you may know, the Earth exerts a gravitational force on all the objects on it. So, when we jump, we are always pulled back down to the ground. Could you guess how much energy would be needed for a satellite to leave the Earth and reach to the Moon? Did you know that the Moon could help us to tell the time? Yes, it can! 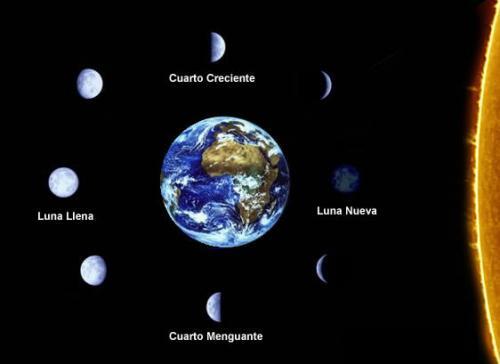 We could study the different phases of the Moon (see image below). Even though half the Moon is always lit up by the Sun, the Moon appears to change shape. This is because we see different amounts of the lit up part of the Moon as it orbits the Earth. 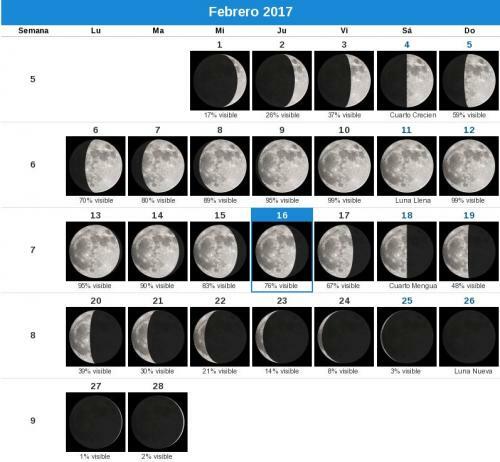 The Moon phases can be divided into: New Moon, First Quarter, Full Moon, Last Quarter and its intermediate phases. The Moon repeats these phase every 27 days. Since the early ages, humankind has used the different phases of the Moon as a useful indicator of the passage of time, for example, to know when to plant and harvest crops. Did you know that the Moon is responsible for ocean tides on Earth? The rotation of the Moon around the Earth creates a gravitational force between both objects, which is responsible for the rise and fall of the ocean tides. Did you know that your weight would be different on the Moon? The Moon is four times smaller than Earth and its mass is 81 times lower. The Moon, having less mass, would pull us toward the ground with less force than we feel on Earth (17% less). You’d want to jump on the Moon, right? If we were to launch satellites from the Moon into space, we would need less energy, and would therefore need less fuel. Do you think it would be a good idea to have shuttles on the Moon? Have you ever seen the Moon through a telescope or binoculars? The image below shows the Moon’s seas and craters, along with their names. Do you know when the first telescope was built? Well, it was not until the end of the sixteenth century (about the year 1600 AD). Have humans ever been to the Moon? Perhaps your grandparents or your parents have talked about how they saw the first person set foot on the Moon on television. Amazing! It was in the twentieth century, on 20 July 1969, when astronaut Neil Armstrong stepped on the Moon. Armstrong was the first human to step on the lunar surface, and Buzz Aldrin followed 20 minutes later. Credit: NASA. Do you know what the space missions that took astronauts to the Moon were called? It was the Apollo 11 mission that was the first to land on the Moon, and whose astronauts were the first humans to walk on the surface of another astronomical object. The complete crew flying on this mission were: Commander Neil Armstrong, Eagle Lunar Module pilot Buzz Aldrin and the second pilot of the ship, Michael Collins. Imagine all the important work and previous missions that were necessary to prepare for this amazing feat. How many people do you think are part of a space mission? It depends on the mission, but always more than 100 people. As you can imagine, not all of them fly into space, but they are all vital for the success of the mission. NASA's Mission Control Center in Houston, Texas, during the landing of Apollo 11, the first mission that landed on the Moon (NASA). Credits: NASA. There are people in charge of designing the mission and studying its viability; people in charge of building the different parts of the spacecraft; experts in developing and maintaining the software that goes on board the spacecraft; people who make calculations from Earth; people who build and control the antennas; people who manage the logistics and the personnel; and more! At ESA, there are people from all of these professions working on all the missions at the ESA centres across Europe and beyond. Humans have only visited the Moon six times, and now ESA, along with space agencies around the world, are planning to go back. This return to the Moon envisages a series of human missions starting in the early 2020s that would see astronauts interact from orbit with robots on the lunar surface. Robots will land first, paving the way for human explorers. What job would you like to do in the next missions to the Moon?